The beatification of Oscar Romero, Latin America’s martyr and hero, is attracting hundreds of thousands of people at the El Salvador ceremony. The Roman Catholic archbishop murdered during the 1980-1992 civil war. At least 250,000 people are expected to fill the streets of the capital San Salvador for the ceremony. It is the last step before Archbishop Oscar Romero is declared a saint. Oscar Romero was shot dead by a sniper as he celebrated Mass in a hospital chapel on March 24, 1980. No-one has been prosecuted for the murder. About 80,000 people died and 12,000 disappeared during the war in El Salvador. The Archbishop of San Salvador, Luis Escobar Alas, and Vatican envoy Cardinal Angelo Amato are expected to preside over Saturday’s beatification ceremony. The event will begin with a procession from the cathedral – where Oscar Romero’s remains lie in a crypt. A letter will then be read proclaiming the archbishop “blessed”. Giant TV screens have been placed across the capital so that those away from the stage can watch the ceremony. Thousands of police officers have also been deployed. 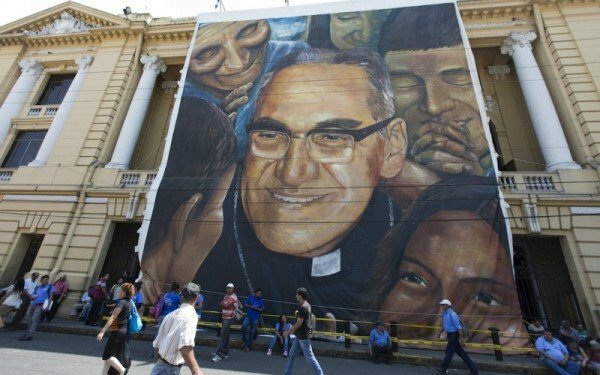 Archbishop Oscar Romero was not just a churchman. He took a stand during El Salvador’s darkest moments. When the US-backed Salvadorean army was using death squads and torture to stop leftist revolutionaries from seizing power, Oscar Romero was not afraid to speak out in his weekly sermons. “The law of God which says thou shalt not kill must come before any human order to kill. It is high time you recovered your conscience,” he said in his last homily in 1980, calling on the National Guard and police to stop the violence. That was a sermon that cost him his life. A day later, while giving mass, he was hit through the heart by a single bullet. Several conservative Latin American cardinals in the Vatican had blocked his beatification for years because they were concerned his death was prompted more by his politics than by his preaching. Pope Benedict XVI finally reversed this in 2012.